I emailed my customer invoice but I have not received a confirmation from the client. I just need to make sure the email was sent successfully. In QBO, currently, there is no SENT EMAIL section like you see on Gmail so everything is workaround method. So, this is how it works it QBO. 1) You can use the Sales Transactions (dashboard > sales > sales transactions) window to find the emailed invoice status. You will see a status code like SENT or VIEWED under status column. In case, you don’t see STATUS column, click the middle Gear Settings option (⚙) above the Action column. Click “Show More” and put a checkmark in the Status box. 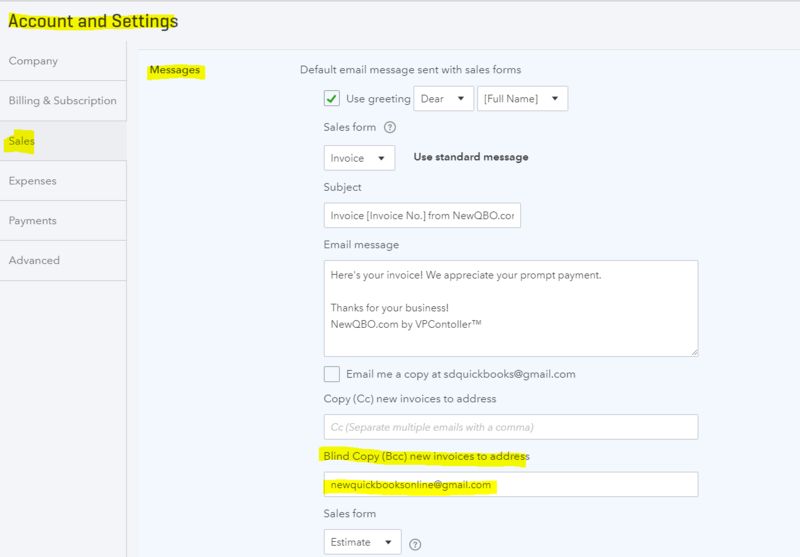 2) You may also add your email to the BCC section of invoice message box under Sales in Settings. (Gear (⚙) at the upper right corner > Your Company > Account and Settings > Sales > Messages > click “Default email message sent with sales forms” pencil icon > Under “Blind Copy (Bcc) new invoices to address” add your own email address > Save and Done. This way you’ll get a copy of all the invoices email sent to your customers. I prefer separate new email address so that everything will be one place.